Up until a relatively short time ago, we, as a society, recognized the family as the most important institution to the building of a just and harmonious society. The family was seen as the place in which we learned fundamental values, among which are how to love one another, how to forgive one another, and how to put others before myself. The family was seen as a school of love and self-forgetfulness. This selflessness was learned from watching the example of a husband and wife whose principle task was to “establish between themselves a partnership of their whole life, … which of its own very nature is ordered to the well-being of the spouses and to the procreation and upbringing of children” (canon 1055 §1). We knew that for a happy and successful marriage, a husband needed to put the needs of his wife ahead of his own. We knew that for a happy and successful marriage, a wife needed to put the needs of her husband ahead of her own. We knew that for a happy and successful marriage, a husband and wife had to safeguard their relationship and look to it first. We knew that parents needed to put the needs of their children ahead of their own and that children should honor and respect their children, just as parents should honor and respect their children. We knew that if each member of the family looked to the example of Christ Jesus family life would be beautiful, attractive, and lifegiving. But something happened along the way and we decided it was acceptable to ignore centuries of wisdom. Rather than continuing to protect and safeguard the family because of its importance to the common good, we decided it was acceptable to redefine and to refashion the family because of our selfish desires. We first decided that no longer should children be received and welcomed as gifts and blessings from God, but that we should instead be able to determine when and how many were accepted. When contraception was widely used and considered good, despite its clear violation of the law of nature, husbands and wives decided they could separate the two aims of the marital act; they changed its primary focus from that of a complete gift of self to each other and turned it into the satisfaction of individual desires. No longer would marriage be about the mutual well-being and unity of the spouses that increased their love and made it fruitful; it would no longer be about each other, but what other others can do for me. From here, a second decision that children could be done away with if they were not wanted seemed an obvious – even if grotesque and deplorable - consequence. Once marriage was no longer seen as the full sharing of life and love between the spouses, it was an easy jump to say that marriage was also no longer permanent. First we decided that marriages could simply be dissolved in difficult and tragic circumstances. Then, quite against the very clear words of the Lord Jesus, we decided that marriages could be ended for any reason, or even no reason at all. As these changes to the long-standing and accepted definition of marriage were made over the course of just a few decades, most Christians regrettably went along with them and even welcomed them gladly. From this, as many rightly warned, the family received a very great wound from which it has not recovered. Family life began to fall apart and, with it, society, as well. These are not popular words today, but the truth is not always very popular. The Bible is full of families, births, love stories and family crises. This is true from its very first page, with the appearance of Adam and Eve’s family with all its burden of violence but also its enduring strength (cf. Gen 4) to its very last page, where we behold the wedding feast of the Bride and the Lamb (Rev 21:2, 9). We forgot that family life – and even life generally – is not necessarily meant to be easy, but rewarding. We forgot that marriage and the family is to be the school of love and selflessness. We forgot that the family is not about me, but about us. It is a curious reality of the inner workings of the mind of God that he continually chooses to allow us – weak and sinful as we are - to be instruments of his grace. The ability of human couples to beget life is the path along which the history of salvation progresses. Seen this way, the couple’s fruitful relationship becomes an image for understanding and describing the mystery of God himself, for in the Christian vision of the Trinity, God is contemplated as Father, Son and Spirit of love. The triune God is a communion of love, and the family is its living reflection. Saint John Paul II shed light on this when he said, “Our God in his deepest mystery is not solitude, but a family, for he has within himself fatherhood, sonship and the essence of the family, which is love. That love, in the divine family, is the Holy Spirit”. The family is thus not unrelated to God’s very being. We came to reshape marriage according to our own desires because we forgot that we are made in the image and likeness of God and that marriage is meant to reflect the inner life of God, to make his love the foundation of our lives. This is, in part, why the Second Person of the Most Holy Trinity chose to be born of a woman and to take on our flesh at Bethlehem. The importance of the family is intimately involved with the mystery of Christmas and gives us good reason to ask how well our families reflect the love of the Trinity. The presence of so many young children in this parish is a sign of great hope for the future, not only for the future of this parish, but for that of society as a whole, and their chattering and laughs makes my heart smile. We know it takes only a little yeast to leaven the dough and only a small flame to dispel the darkness. You, young parents, have a tremendous and beautiful opportunity and mission. Put on, as God's chosen ones, holy and beloved, heartfelt compassion, kindness, humility, gentleness, and patience, bearing with one another and forgiving one another, if one has a grievance against another; as the Lord has forgiven you, so must you also do. And over all these put on love, that is, the bond of perfection. And let the peace of Christ control your hearts, the peace into which you were also called in one body. And be thankful (Colossians 3:12-15). Allow your marriage to be marked by gratitude, forgiveness, and love so that you may always reflect the merciful love of the Christ Child to a hurting world. Let your marriage always shine out as a beacon of hope to the suffering. Teach your children how to forgive one another and how to let go of grudges. Teach them, through your own example, the beauty of a life lived for others. Teach them to trust in God and not in themselves. Teach them to open their hearts to God and to allow him to dwell in them richly. If you do this, if you make your marriages a full sharing of life and love and a true and complete self-gift to each other, your marriages will be happy and successful and, more importantly, you will be reflections of God’s love; you will attain your purpose. You and your children, by the grace of God, will be able to begin slowly rebuilding and refashioning society by restoring a recognition of the beauty of marriage. Let families, then, be again schools of love and selflessness. Let them place the Child Jesus in the center of their hearts! Let us always give thanks to the Father for the gift of his Son and, like the prophetess Anna, speak of him to all who will listen, both in our words and in the manner of our lives. Let us strive to conform our lives to him and so change the times in which we live that we may all come to dwell in the joy of the Father’s house. Amen. Pope Francis, Amoris Laetita, 8. Pope Francis, Amoris Laetitia, 11. Pope Saint John Paul II, Homily at the Eucharistic Celebration in Pueblo de los Angeles, 28 January 1979. Saint Augustine of Hippo, Sermon 30.8. Christmas is a feast that can only truly be celebrated by the humble. In the context of our present American society, humility is not seen as a virtue, perhaps because it is so greatly misunderstood. Instead of being encouraged to be humble, we are continually instructed that we must promote ourselves over and against others. We honor those who become celebrities and seek to emulate them, even to the point of desiring fame not for having done something important or useful, but simply to be famous. The virtue, if you will, of our modern society is not humility, but pride. The mystery of Christmas – the mystery of God made flesh - stands in stark contrast to this mindset. If you should ask me what are the ways of God, I would tell you that the first is humility, the second is humility, and the third is humility. Not that there are no other precepts to give, but if humility does not precede all that we do, our efforts our meaningless. This is why Saint Paul urges us “have this mind among yourselves, which was in Christ Jesus, who, though he was in the form of God, did not count equality with God a thing to be grasped, but emptied himself, taking the form of a servant, being born in the likeness of men” (Philippians 2:5-7). The humility of God is of a such a nature that he did not choose to be born in the halls of the powerful or in the libraries of the learned. He chose, rather, to be born to an unknown woman from an insignificant town and to be placed among the animals. In all this, we see that “God is not loud. He does not make headlines.” He has not need to openly declare his presence because the light of his love attracts the humble and beckons to anyone who seeks to have the burden of his sin lifted and removed. 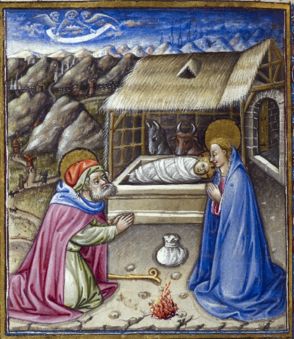 As we approach the manger of Our Lord to contemplate the mystery of the unimaginable humility of God who took on our flesh out of love for us, each of us must ask an important question: “Am I humble?” It is not a question anyone else can answer for us; the answer can only be found in the recesses of our hearts. It can only be answered by considering how well we have conformed ourselves to the Lord’s words: “Take my yoke upon you and learn from me, for I meek and humble of heart” (Matthew 11:29). If anyone would like to acquire humility, I can, I think, tell him the first step. The first step is to realise that one is proud. And a biggish step, too. At least, nothing whatever can be done before it. The proud cannot hold fast to the humility of God, but the humble can because they know why he came as an infant. Those who are humble know themselves to be sinners in need of a Savior, and so they welcome the Birth of the Son of God with joy; they approach the Child of Bethlehem singing the goodness of the Lord because they know he has come to save his people from their sins (cf. Psalm 89:2; Matthew 1:21). The proud cannot do so because they do not recognize themselves to be sinners and so cannot enter into the joy of these holy days. means that we emerge from the fundamental law of egotism, self-assertion, self-sufficiency, and that we commend ourselves to the new law of Jesus Christ, who is the man for others and the Son of the Father in the eternal exchange of triune love. Because we cannot do this by ourselves, the offering of Christians means precisely by this: allowing Christ to take us mercifully by the hand and lead us into the inner unity of his organism, his holy Church, and thus, in union with him, to become like God. The humble will allow themselves to be led by a little child, but the proud will not (cf. Isaiah 11:6). In these coming days of Christmas, let each of us humbly approach the Holy Infant remembering that Christmas is about his gift, not ours. Let us bend low before the manger of Christ Jesus who humbled himself for us; let us approach him with the humility of sinners approaching the Savior and Redeemer who offers the humbling gift of merciful love. If we do, we can keep our patron’s counsel and hold fast to the humility of God and know the full joy of these holy days by humbly taking our places with the animals, the shepherds, and Our Lady of Humility to adore with them Christ the Lord who will enfold us within his merciful love. Amen. Joseph Ratzinger, Homily, 14 July 1991. In Joseph Ratzinger/Benedict XVI, Teaching and Learning the Love of God: Being a Priest Today (San Francisco: Ignatius Press, 2016), 292. C.S. Lewis, Mere Christianity, (New York: HarperCollins Publishers, Inc., 2001), 128. Joseph Ratzinger, Homily, 1 July 1978. In Joseph Ratzinger/Benedict XVI, Teaching and Learning the Love of God: Being a Priest Today (San Francisco: Ignatius Press, 2016), 89. So great is the mystery of the Incarnation of the only begotten Son of God that even before Mother Church begins her celebration of Christmas she proclaims the Annunciation to us. In doing so, we are invited to be more passive with the Lord, to allow him to prepare our hearts for his coming, to allow him to shape us, mold us, and fashion us. Such passivity, though, can be difficult because we must abandon ourselves and surrender to the workings of the Holy Spirit. No longer can we seek to control and direct our lives; we must instead humbly turn to the Lord and follow his lead. David and Mary represent for us two possible ways to approach this last day of Advent, one beneficial and the other not. It was I who took you from the pasture and from the care of the flock to be commander of my people Israel. I have been with you wherever you went, and I have destroyed all your enemies before you. I will fix a place for my people Israel; I will plant them so that they may dwell in their place without further disturbance (II Samuel 7:8-10). When David began to think he accomplished his great victories through his own skill, the Lord reminded him he had not. Rather, it was the Lord himself who did all of this for him; David did nothing, the Lord did it all. How, then, could David possibly hope to build a house for the Holy One of Israel? He wanted to welcome God into his life on his own terms. How often do we desire to do the same? Like, David, Mary, too, wanted to prepare a house for the Lord, but unlike David, she sought to prepare a spiritual and internal dwelling for the Lord; whereas David desired to build a house for the Lord out of wood and stone, Mary desired to build a house for the Lord out of her heart and soul. It is a great wonder that when Mary wanted the Lord to dwell within her spiritually, he made his home within her physically. What greater marvel could there be? Through Mary, the word the Lord spoke through Nathan was fulfilled, “I will be a father to him, and he shall be a son to me” (II Samuel 7:14). The Creator of all things would be born of his humble creature. At this great message, Mary quietly said to the angel, “Behold, I am the handmaid of the Lord. May it be done to me according to your word” (Luke 1:38). She welcomed the Lord into her life on his terms, not her own, “and because the Virgin Mary humbled herself, she prepared herself for God’s grace.” She consented entirely to the will of God and allowed him to prepare within her a most worthy and fitting temple in which he would dwell. Let each of us take Mary as our model and follow her loving example. We expend so much effort and energy making everything just right at Christmas: the ornaments must be carefully placed on the tree; the Nativity scene displayed just so; the dining room table neatly set; the lights brightly twinkling; the presents beautifully wrapped. These things are not unimportant, but we can, like David, seek to direct too much. We can control the state of our physical homes to receive our human guests, but let us not seek to control the state of our hearts to receive the Divine Guest lest we inadvertently close the door to him. When we, like David, attempt to prepare a dwelling for the Lord through our own initiative and through our own desires, let us not be ashamed when the Lord corrects us. He calls us, like Mary, to be passive cooperators with him as he prepares us to receive him into our hearts at Christmas and, indeed, every time we receive Holy Communion. The Lord frequently comes to us and invites us to receive him; he asks us to be molded, shaped, and formed by him and not by our own desires and egos. He speaks to us in the depths of our hearts and invites us to cooperate with his grace to conform our lives more and more to that of his Divine Son, who was born of the Virgin Mary for our salvation from sin and death. Christmas is about much more than a heart-warming story. Let us follow Mary. Let us not argue with God, let us not give him directions or advice, but let us instead consent to his will and allow him to prepare our hearts for him. When we feel him stir within our hearts, let us not dismiss him, but let us rather open wide the door to him. The Lord desires to fill each of us with his presence, with his love, his peace, his joy. He will never force us to welcome him, but he asks to be welcomed in. On this last day of our waiting in joyful hope, let us allow the Lord to build a dwelling for the Most High within us. Let us follow Mary and rely entirely upon his love and mercy and so welcome him with gratitude and joy. Then we shall indeed worthily celebrate his Birth. Amen. Saint Bonaventure, Commentary on the Gospel of Luke, 1.68.